"We're gonna show everybody that he's the fastest horse in the world." There have been a lot of truly awful so-called "kids and animals" films, usually centered on a misunderstood child and his/her relationship with some type of special pet, generally a spunky dog, a mischievous monkey or a clever seal. Most films of this ilk pile on the one-dimensional characterizations and bulk up on sugary storylines that could send a viewer into a life-threatening diabetic coma. The good news is that this 1979 film version of Walter Farley's popular The Black Stallion novel, made with the blessing of executive producer Francis Ford Coppola, is one of those rare enjoyable treats that is almost too good for children.The Black Stallion is set in 1946, and centers around a young boy named Alec Ramsay (Kelly Reno), and his life-changing relationship with a wild Arabian stallion. The film opens aboard a steamer in stormy waters off the coast of North Africa, with Alec catching glimpse of the title horse being forced against its will into its berth. When the ship sinks during a rather intense storm scene (for a G-rated film, that is), Alec is separated from his father, played by Hoyt Axton, and is literally saved from drowning by the horse, in a sequence that is handled with far more believability than the idea might sound.Alec and the horse wash up alone on a deserted island, and the middle chunk of The Black Stallion becomes sort of a "Cast Away, Jr.", establishing the developing friendship between the two, as well as the boy's grief over losing his father. Largely dialogue-free for nearly the first hour, the island scenes are some of the most visually stunning moments of the entire film, and is where director Carroll Ballard and cinematographer Caleb Deschanel really shine. Ballard and Deschanel stage a series of truly breathtaking scenes between Alec and The Black, that do more than simply move the story forward; they are moments of cinematic art, without becoming too cloying. When Alec is first trying to feed the horse from his hand, to earn his trust, the backlit sequence is shot with each character appearing at the far edge of the frame and the expanse of the beach between them. An underwater ballet-type scene, featuring only the legs of Alec and The Black makes full use of Carmine Coppola's score to sell the moment, and reinforce the fact that this is not just a simple children's tale.The latter part is centered around Alec and The Black's return to a Norman Rockwellian civilization (in this case Toronto, doubling as Flushing, New York) and their involvement with a former horse-trainer named Henry (Mickey Rooney). Even with some of the predictable elements of the screenplay, especially with the climactic "race of the century," the visual acuity of Ballard and Deschanel is able to continually generate a soft-focus world that is every bit as strong and lyrical as the island scenes. Kelly Reno is good as young Alec, and though he doesn't have much in the way of dialogue, he conveys the requisite amount of natural emotion. Rooney, who comes across in other films as occasionally annoying and hammy, is in low-key charmer mode here, and never seems to be working to upstage anyone. It is a clever bit of casting placing Rooney as the horse trainer, as he also starred in a similar role in another landmark, horse-themed film, the 1946 release of National Velvet. Clarence Muse has a small, but pivotal role, as the mysterious carriage driver Snoe, and is introduced in a well-crafted dream-like fog sequence.The only flaw here is the pacing, which may seem stifling to some younger viewers. With a runtime that clocks in at just short of two hours, director Ballard allows the story to unfold gracefully. I used my ten-year-old daughter Sammy's squirminess as an indicator, and she probably would have preferred a more rapidly edited film. Image Transfer Review: The Black Stallion's strength lies not in the story as much as it is the terrific cinematography of Caleb Deschanel, who gives this film a myriad of solid visual sequences. MGM's 1.85:1 widescreen transfer is very well done, despite a couple of age flaws. Picture quality tends to lean toward a soft focus, with strong detail. Colors are well-saturated, and fleshtones play very natural and lifelike. A few specks and nicks are apparent, as is some fine grain that is noticeable during a couple of the night fog sequences.Disregard the available full-frame transfer, as it completely ruins the stellar work of Deschanel. Stick with the 1.85:1 version, even with the minor source print flaws. Audio Transfer Review: Who needs 5.1 when a 2.0 surround track can be just as enjoyable? This is a well-mixed surround track that provides enough rear channel cues to make for a very engaging experience. The shipwreck sequence is properly loud and encompassing, and the directional imaging across the fronts is more than adequate. Where this track really excels is during the scenes that feature galloping horses, and it surprisingly generates a fair amount of rumble. Dialogue is minimal in this film, but what there is sounds clean.French and Spanish mono tracks are also included. Extras Review: The only substantial extra is a two page production notes insert that give some brief tidbits on the filming of The Black Stallion.A grainy, fullframe theatrical trailer and a whopping 32 chapters are also included. Ballard and Deschanel, who would later recreate similar visual beauty with Fly Away Home, have assembled a wonderful tale that is only hampered by a somewhat slow and lazy narrative pace, which may make some of today's MTV edit-weened youngsters a bit fidgety. 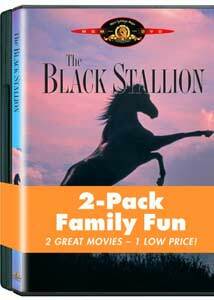 This is the kind of film that is far too good to be simply described as being just for children.MGM has repackaged The Black Stallion in a low-priced 2-pack, along with the forgettable sequel The Black Stallion Returns (1983). It's worth it just for the original. Recommended.